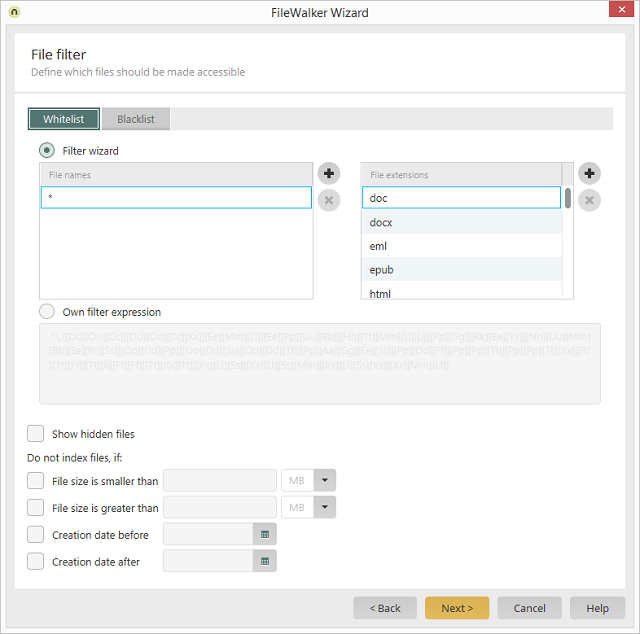 File names or file extensions contained in this list will be permitted for the FileWalker. With this option, you can permit file names, wildcards can be used here as well, and file extensions for the FileWalker. Adds another row to the list. By double-clicking in the row, the value can be modified. Deletes the selected entry from the list. If this option is selected, you can enter your own filter expression here. Additional information about this topic can be found here. Shows hidden files as well. With the settings in this section, you can determine which files should be included in the index. The settings on this tab correspond to those of the whitelist. File names entered here will not be allowed to be shown or accessed using the FileWalker.